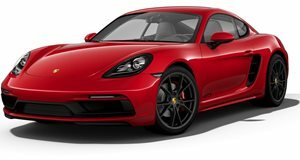 Porsche hasn't traditionally offered quite as many variants of the 718 (before or since it received the numeric designator) as it has of its big brother, the 911. But taken one step closer with the introduction of the 718 T, shown to the public for the first time at the Geneva Motor Show this week. Available as both a Boxster convertible and Cayman coupe, the T variant is actually one of the least powerful versions on offer, packing the smaller 2.0-liter turbo four from the base model instead of the larger 2.5-liter unit from the S and GTS models.